Con Pane is a hot spot in Point Loma with customers constantly bustling in and out. Whether you are in the mood for delicious gourmet sandwiches, pastries, or freshly baked breads, Con Pane is the perfect place to stop by for lunch. This cafe is especially a favorite for Point Loma locals where the options are endless. 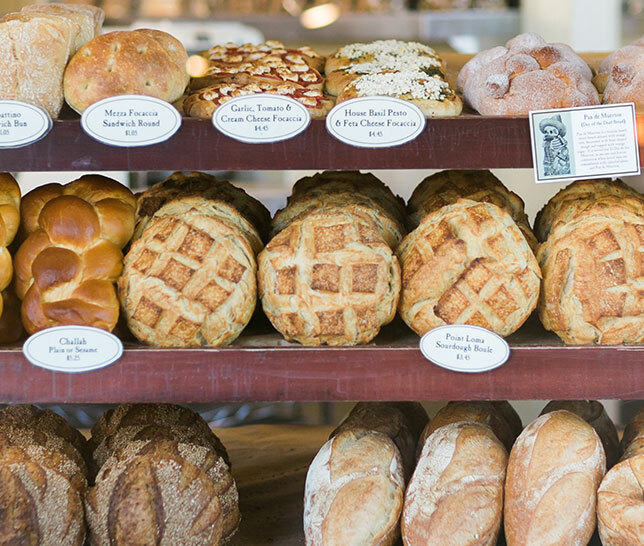 Con Pane is the place for all bread connoisseurs and pastry lovers. The Turkey Cobb sandwich is one of the more popular items on the menu. This sandwich features a tasty combination of turkey, applewood smoked bacon, fresh avocado, crumbled gorgonzola, house roma tomatoes, and lettuce. Whether you pair these ingredients with rosemary and olive oil bread or sourdough you absolutely cannot go wrong. Any sandwich can be perfectly paired with a pastry of your choice...dark chocolate chip cookie recommended! The cafe environment is casual and perfect for an outing with friends and family. Be wary that this cafe is closed on Wednesdays and also tends to be extremely busy during lunch hours, but it is well worth the wait!